I don't know if I mentioned it, but I was gifted a Kindle Fire for Christmas. I've yet to decide whether it beats my Sony ereader (I'm not a fan of the Kindle's back lit screen). However, I realised yesterday evening that I've been so busy, I've barely tried out the Kindle. That in combination with the fact that I've decided to re-engage with my research, I thought I'd trawl the Kindle Store for interesting books on 9/11. Quickly dismissing much of what my search threw up, I came across Past Tense, Forever Present: Remembering 9/11, a collection of short essays by the Canadian Critics at Large. Drawn to it by its title, and the fact that the collection purported to discuss a range of topics; first hand accounts, political impacts, and the influence of the attacks on contemporary culture, peppered with a collection of interesting illustrations, I decided to download it. So I spent a short time (the collection is rather short and I'm a fast reader) immersing myself in the experience of eleven assorted writers. As I would expect from a selection as varied as this, there were some essays I engaged with more than others. Andrew Dupuis' account of hearing of the attacks when he was still at school struck a certain chord, as I was also school age on September 11th 2001. He describes a lack of feeling at the time, which poignantly came to a head years later as he watched Matt Reeve's Cloverfield. This delayed response to trauma is something I have experienced once or twice in my own life, furthering my ability to relate to this particular author. Mark Clamen begins to consider representations of death in contemporary television, arguing successfully that very few shows account for the reality of death (exceptions include the wonderful Six Feet Under, and the fantastical Dead Like Me), presenting it more as a predictable event used only to create drama. This has obvious links to my own study of death in contemporary poetry. His focus is on the 2012 series Awake, which I'm now eager to watch. Far and away the best essay in the collection is a very personal piece 'Seven Days in September' by Deirdre Kelly, in which she recounts her time as a journalist stranded in New York City on that day, in a piece which is beautiful, atmospheric, and wrenching. 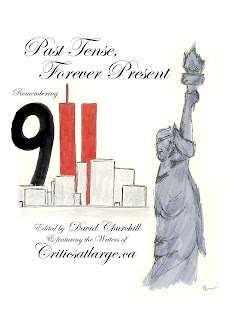 While I can't say that I always agreed with the views being put forward by the authors in this ebook (there seemed a tendency towards a Conservatism I find it difficult to relate to), this is a good assortment of essays for anyone who is interested in the enduring nature of our experience of the 9/11 attacks.